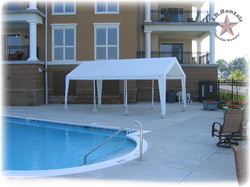 10 ft. x 20 ft. canopy tent shown without sidewalls. Used at a private pool-side event. Shown installed with (8) weights. May be installed staked or weighted.